RENO, Nev. – Bryanna Coté of Red Rock, Arizona, will bowl for her first major championship after earning the top seed in the stepladder finals Monday at the 2018 United States Bowling Congress Queens. The stepladder finals will air live on CBS Sports Network on Tuesday at 8 p.m. Eastern. The winner will claim the coveted tiara and top prize of $20,000. The USBC Queens is the first major of the 2018 Professional Women’s Bowling Association Tour season. Coté, a 32-year-old right-hander, won six consecutive matches in the double-elimination bracket at the National Bowling Stadium over two days to claim the top seed, including a come-from-behind win against Shannon O’Keefe of O’Fallon, Illinois, in the winners bracket final, 641-637. O’Keefe was up by 11 pins heading into the third game of the total-pinfall match and had the opportunity to shut out Coté in the 10th frame with a 29-pin fill, but left a 10 pin on her first delivery. Coté needed a mark to complete the comeback, and she converted a 7 pin to earn her spot in the title match. Coté will bowl for the title for the second consecutive week on the PWBA Tour. She was the top seed at the PWBA Fountain Valley Open but fell to Danielle McEwan of Stony Point, New York, in the finals, 215-182. She plans on sticking to the same process for Tuesday’s title match, knowing she only can control what happens behind the foul line at the NBS. USBC Hall of Famer and two-time Queens champion Liz Johnson of Palatine, Illinois, Stefanie Johnson of McKinney, Texas, and Amanda Fry of Antelope, California, are the No. 3, No. 4 and No. 5 seeds for the stepladder, respectively, after advancing through the elimination bracket Monday. In the shootout round, Liz Johnson used the momentum of a 287 effort in Game 2 to lead the way with a 731 series to earn the third spot, while Stefanie Johnson grabbed the fourth spot with 663. Fry rolled 225 in her final game to hold onto the final spot with 620. Sydney Brummett of Fort Wayne, Indiana, was eliminated in the shootout round and finished in sixth place after posting a 585 series. A total of 191 bowlers from 14 countries competed in three five-game blocks of qualifying over three days this week to determine the 63 players joining defending champion Diana Zavjalova of Latvia in the double-elimination match-play bracket. Each bracket match leading up to the stepladder included three games, with total pinfall determining which player advanced. The televised portion of the event will feature one-game matches. (9) Bryanna Coté, Red Rock, Ariz., def. (49) Tina Williams, Phoenix, 658-568. (5) Stefanie Johnson, McKinney, Texas, def. (45) Clara Guerrero, Colombia, 690-600. (38) Amanda Fry, Antelope, Calif., def. (19) Kelly Kulick, Union, N.J., 661-592. (2) Shannon O’Keefe, O’Fallon, Ill., def. (39) Anna Andersson, Sweden, 665-563. (6) Liz Johnson, Palatine, Ill., def. (64) Shannon Sellens, Copiague, N.Y., 683-661. (25) Josie Barnes, Nashville, Tenn., def. (1) Jenny Wegner, Sweden, 647-620. (54) Brandi Branka, Fairview Heights, Ill., def. (48) Jennifer Russo, Monmouth Junction, N.J., 654-561. (26) Sydney Brummett, Fort Wayne, Ind., def. (37) Shannon Pluhowsky, Dayton, Ohio, 666-568. Coté def. S. Johnson, 698-683. L. Johnson def. Andersson, 733-639. L. Johnson def. Barnes, 632-630. (Three highest scores advance to CBS Sports Network finals, high score is No. 3 seed, second high is No. 4, third high is No. 5, lowest score is eliminated, earns $3,500). L. Johnson 731, S. Johnson 663, Fry 620, Brummett 585. 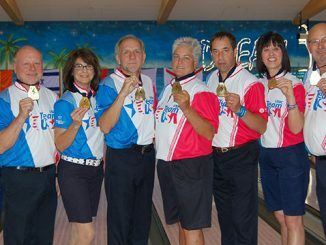 RENO, Nev. – Former Team USA member Tina Williams of Phoenix had her family by her side as she recorded three wins Sunday at the 2018 United States Bowling Congress Queens to stay undefeated in the 64-player double-elimination bracket. Williams is one of eight undefeated players left in match play at the National Bowling Stadium, and a total of 16 bowlers still remain in contention for the $20,000 top prize and coveted tiara presented to the winner. Match play, which consists of three-game total-pinfall matches, will continue Monday at noon Eastern until the five stepladder finalists are determined. The stepladder finals will be broadcast live on CBS Sports Network on Tuesday at 8 p.m. Eastern. While Williams collected wins against Germany’s Birgit Poppler (650-523), Jennifer Russo of Monmouth Junction, New Jersey (673-638), and Sweden’s Jenny Wegner (713-580), she also had the support of her family on-site at the NBS, which included her husband, Professional Bowlers Association Tour champion Stuart Williams, and 20-month-old son, Brady. Her outlook certainly has changed as her family has grown, but she also hopes to serve as an inspiration to her son. The 37-year-old right-hander’s main goal coming into this week was to advance to the bracket. She knew it wouldn’t be an easy road to navigate, but she stuck to her process in hopes of performing at her best for her son. Williams now is two wins away from earning a spot in the stepladder finals, and she’ll face Bryanna Coté of Red Rock, Arizona, to start competition Monday. Regardless of the outcome, she knows she’ll have her biggest fans supporting her until the final ball is rolled. Other matches in the winners bracket include two-time Queens champion Kelly Kulick of Union, New Jersey, taking on Amanda Fry of Antelope, California, Shannon O’Keefe of O’Fallon, Illinois, matching up against Sweden’s Anna Andersson and Colombia’s Clara Guerrero, who rolled the first 300 game of the 2018 event on Sunday, against Stefanie Johnson of McKinney, Texas. Two former Queens champions still remain in contention in the elimination bracket – two-time champion Liz Johnson of Palatine, Illinois, and 2006 winner Shannon Pluhowsky of Dayton, Ohio. Defending champion Diana Zavjalova of Latvia made a valiant run in the elimination bracket after losing in the opening round, winning her next three matches, but was eliminated during the final round of the day by Josie Barnes of Nashville, Tennessee, 697-646. Zavjalova finished tied for 17th place. All players in this year’s field bowled 15 games of qualifying over three days to determine the 63 competitors joining Zavjalova in match play. This week’s event is the first major on the 2018 Professional Women’s Bowling Association Tour schedule. (1) Jenny Wegner, Sweden, def. (64) Shannon Sellens, Copiague, N.Y., 665-612. (33) Megan Kelly, Dayton, Ohio, def. (32) Tish Johnson, Colorado Springs, Colo., 695-678. (48) Jennifer Russo, Monmouth Junction, N.J., def. (17) Julia Bond, Aurora, Ill., 684-602. (49) Tina Williams, Phoenix, def. (16) Birgit Poppler, Germany, 650-523. (9) Bryanna Cote, Red Rock, Ariz., def. (56) Adriana Perez, Mexico, 640-583. (41) Missy Parkin, Laguna Hills, Calif., def. (24) Maria Jose Rodriguez, Colombia, 559-542. (25) Josie Barnes, Nashville, Tenn., def. (40) Britney Brown, Chicago, 612-603. (57) Lorie Schmidt, Henderson, Nev., def. (8) Tannya Roumimper, Indonesia, 614-613. (5) Stefanie Johnson, McKinney, Texas, def. (60) Aldila Indryati, Indonesia, 625-597. (37) Shannon Pluhowsky, Dayton, Ohio, def. (28) Giselle Poss, Nashville, Tenn., 631-549. (44) Sandra Gongora, Mexico, def. (21) Taylor Bulthuis, Coral Springs, Fla., 620-587. (53) Estefania Cobo, Puerto Rico, def. (12) Elysia Current, Ephrata, Pa., 725-606. (13) Sandra Andersson, Sweden, def. (52) Juliana Franco, Colombia, 707-614. (45) Clara Guerrero, Colombia, def. (20) Diana Zavjalova, Latvia, 667-522. (29) Sharon Limansantoso, Indonesia, def. (36) Cajsa Wegner, Sweden, 676-561. (4) Erin McCarthy, Omaha, Neb., def. (61) Briana Zabierek, Lockport, Ill., 687-612. (62) Dena Buxton, Australia, def. (3) Daria Kovalova, Ukraine, 567-555. (30) Lilia Robles, Mexico, def. (35) Haley Richard, Tipton, Mich., 723-665. (19) Kelly Kulick, Union, N.J., def. (46) Lindsay Boomershine, Perry, Utah, 655-617. (14) Danielle McEwan, Stony Point, N.Y., def. (51) Samantha Kelly, Waukesha, Wis., 663-570. (11) Rocio Restrepo, Louisville, Ohio, def. (54) Brandi Branka, Fairview Heights, Ill., 653-579. (22) Brenda Padilla, Mansfield, Texas, def. (43) Jennifer King, Cold Spring, Ky., 649-612. (38) Amanda Fry, Antelope, Calif., def. (27) Sierra Kanemoto, Riverside, Ohio, 646-612. (6) Liz Johnson, Palatine, Ill., def. (59) Ida Andersson, Sweden, 770-751. (58) Daria Pajak, Poland, def. (7) Jordan Richard, Tipton, Mich., 634-594. (39) Anna Andersson, Sweden, def. (26) Sydney Brummett, Fort Wayne, Ind., 661-653. (23) Stephanie Casey, Yonkers, N.Y., def. (42) Verity Crawley, England, 586-580. (10) Diandra Asbaty, Chicago, def. (55) Jackie Carbonetto, Clarksville, Tenn., 640-571. (15) Carolyn Dorin-Ballard, Keller, Texas, def. (50) Mandy Etem, Cave Creek, Ariz., 685-646. (47) Ashly Galante, Palm Harbor, Fla., def. (18) Aseret Zetter, Mexico, 596-540. (31) Cassandra Leuthold, Lincoln, Neb., def. (34) Kayla Bandy, Salisbury, Md., 667-527. (2) Shannon O’Keefe, O’Fallon, Ill., def. (63) Karen Marcano, Venezuela, 697-694. J. Wegner def. M. Kelly, 713-580. S. Johnson def. Pluhowsky, 758-738. Guerrero def. S. Andersson, 639-527. Fry def. L. Johnson, 704-693. A. Andersson def. Pajak, 704-670. Sellens def. T. Johnson, 623-595. Zabierek def. C. Wegner, 649-612. Kovalova def. H. Richard, 695-662. I. Andersson def. Kanemoto, 624-609. S. Kelly def. Boomershine, 665-646. Brummett def. J. Richard, 657-612. Williams def. J. Wegner, 713-580. S. Johnson def. Cobo, 741-687. A. Andersson def. Asbaty, 677-533. L. Johnson def. Rodriguez, 737-637. Parkin def. I. Andersson, 668-561. M. Kelly def. S. Kelly, 618-610. Marcano def. S. Andersson, 659-610. L. Johnson def. Robles, 752-599. Branka def. M. Kelly, 652-641. L. Johnson def. Limansantoso, 650-620. J. Wegner def. Zabierek, 575-532. RENO, Nev. – Sweden’s Jenny Wegner celebrated her 24th birthday Saturday at the 2018 United States Bowling Congress Queens, and one of her presents was a trip to the tournament’s double-elimination match-play bracket at the National Bowling Stadium. 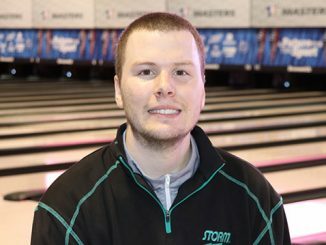 Wegner led qualifying after 15 games at the National Bowling Stadium this week with a 3,472 total, a 231.47 average, and will headline the 64-player bracket starting Sunday at noon Eastern. 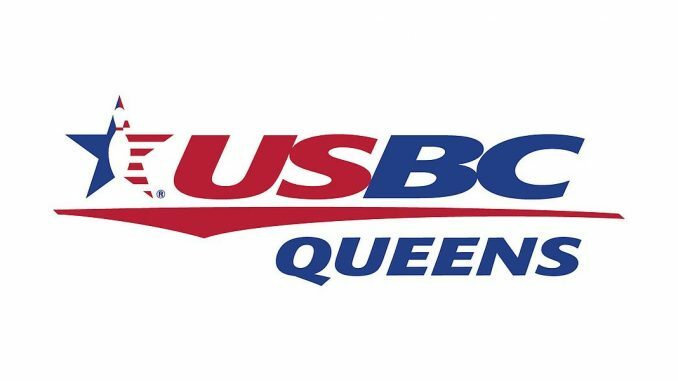 The 2018 USBC Queens, the first major on the 2018 Professional Women’s Bowling Association Tour schedule, will run through May 22 at the famed 78-lane venue, with the stepladder finals being broadcast live on CBS Sports Network on May 22 at 8 p.m. Eastern. Wegner jumped into second place in the standings Friday after posting the highest block of the day (1,185), and she used Saturday’s final round to learn as much as she could about her equipment and the characteristics of the NBS. She rolled games of 233, 248, 199, 247 and 208 for a 1,135 total Saturday. Although Wegner celebrated her birthday nearly 5,000 miles away from home, she certainly felt surrounded by family in Reno. Nine additional players, as well as coaches, made the trip from Sweden, including her sister, Cajsa. Five of the 10 players from Sweden advanced to match play. Joining Wegner in the top 64 are 2016 Queens runner-up Sandra Andersson, Cajsa Wegner, Anna Andersson and Ida Andersson. Shannon O’Keefe of O’Fallon, Illinois, finished second with 3,439, and Ukraine’s Daria Kovalova, who led the first two rounds of qualifying, was third with 3,415. Erin McCarthy of Omaha, Nebraska, finished fourth with 3,398, and Stefanie Johnson of McKinney, Texas, rounded out the top five with 3,383. Defending champion Diana Zavjalova of Latvia finished qualifying tied in 19th place with a 15-game total of 3,283. She’ll face Colombia’s Clara Guerrero in Sunday’s opening round of match play. Zavjalova, a two-time Queens champion, was guaranteed the No. 64 spot in the double-elimination match-play bracket but was able to improve her seeding through qualifying. Three bowlers tied for the 63rd position in the bracket, resulting in a one-game roll-off to determine the final two competitors advancing to match play. Sweden’s Nina Flack, Venezuela’s Karen Marcano and Shannon Sellens of Copiague, New York, each finished qualifying with a 3,116 total, a 207.73 average. Marcano delivered six consecutive strikes in the early going to earn her spot in match play with a 233 game, and Sellens advanced with 168. Flack was unable to recover from three open frames and was eliminated with 160. Marcano, the No. 63 seed, will face O’Keefe, and Sellens, the No. 64 seed, will bowl Wegner. For seeding purposes, ties are broken by high block. 1, Jenny Wegner, Sweden, 3,472. 2, Shannon O’Keefe, O’Fallon, Ill., 3,439. 3, Daria Kovalova, Ukraine, 3,415. 4, Erin McCarthy, Omaha, Neb., 3,398. 5, Stefanie Johnson, McKinney, Texas, 3,383. 6, Liz Johnson, Palatine, Ill., 3,363. 7, Jordan Richard, Tipton, Mich., 3,357. 8, Tannya Roumimper, Indonesia, 3,351. 9, Bryanna Cote, Red Rock, Ariz., 3,344. 10, Diandra Asbaty, Chicago, 3,343. 11(tie), Rocio Restrepo, Louisville, Ohio, and Elysia Current, Ephrata, Pa., 3,338. 13, Sandra Andersson, Sweden, 3,330. 14, Danielle McEwan, Stony Point, N.Y., 3,328. 15, Carolyn Dorin-Ballard, Keller, Texas, 3,311. 16, Birgit Poppler, Germany, 3,291. 17, Julia Bond (n), Aurora, Ill., 3,290. 18, Aseret Zetter, Mexico, 3,288. 19(tie), Diana Zavjalova, Latvia, and Kelly Kulick, Union, N.J., 3,283. 21, Taylor Bulthuis (n), Coral Springs, Fla., 3,272. 22, Brenda Padilla, Mansfield, Texas, 3,267. 23, Stephanie Casey (n), Yonkers, N.Y., 3,266. 24, Maria Jose Rodriguez, Colombia, 3,254. 25, Josie Barnes, Nashville, Tenn., 3,245. 26, Sydney Brummett, Wichita, Kan., 3,243. 27, Sierra Kanemoto (n), Riverside, Ohio, 3,242. 28, Giselle Poss, Nashville, Tenn., 3,239. 29(tie), Sharon Limansantoso (n), Indonesia, and Lilia Robles, Mexico, 3,223. 31, Cassandra Leuthold, Lincoln, Neb., 3,222. 32, Tish Johnson, Colorado Springs, Colo., 3,218. 33, Megan Kelly, Dayton, Ohio, 3,213. 34, Kayla Bandy, Salisbury, Md., 3,210. 35, Haley Richard, Tipton, Mich., 3,207. 36(tie) Shannon Pluhowsky, Dayton, Ohio, and Cajsa Wegner, Sweden, 3,205. 38(tie), Amanda Fry, Antelope, Calif., and Anna Andersson (n), Sweden, 3,190. 40, Britney Brown (n), Chicago, 3,188. 41, Missy Parkin, Laguna Hills, Calif., 3,182. 42, Verity Crawley, England, 3,180. 43, Jennifer King, Cold Spring, Ky., 3,178. 44, Sandra Gongora, Mexico, 3,175. 45, Clara Guerrero, Colombia, 3,174. 46, Lindsay Boomershine, Perry, Utah, 3,168. 47, Ashly Galante, Palm Harbor, Fla., 3,166. 48, Jennifer Russo (n), Monmouth Junction, N.J., 3,165. 49, Tina Williams (n), Phoenix, 3,161. 50(tie), Samantha Kelly, Waukesha, Wis., and Mandy Etem (n), Cave Creek, Ariz., 3,155. 52, Juliana Franco, Colombia, 3,154. 53(tie), Brandi Branka, Fairview Heights, Ill., and Estefania Cobo (n), Puerto Rico, 3,151. 55, Jackie Carbonetto, Clarksville, Tenn., 3,148. 56, Adriana Perez (n), Mexico, 3,147. 57, Lorie Schmidt (n), Henderson, Nev., 3,137. 58, Daria Pajak, Poland, 3,133. 59, Ida Andersson, Sweden, 3,132. 60, Aldila Indryati (n), Indonesia, 3,130. 61, Briana Zabierek (n), Lockport, Ill., 3,127. 62, Dena Buxton, Melbourne, 3,118. *63(tie), Karen Marcano, Venezuela, and Shannon Sellens (n), Copiague, N.Y., and Nina Flack, Sweden, 3,116. *The three players tied for 63rd place competed in a one-game roll-off to determine the No. 63 and No. 64 seeds. Marcano (233) and Sellens (168) advanced. Flack (160) did not advance. *65, Nina Flack, Sweden, 3,116. 66, Kristie Leong (n), Daly City, Calif., 3,113. 67, Katie Ann Sopp (n), White Bear Lake, Minn., 3,112. 68, Olivia Sandham, St. Joseph, Mo., 3,106. 69, Nadia Nuramalina (n), Indonesia, 3,105. 70, Natalie Goodman, O’Fallon, Ill., 3,099. 71, Iliana Lomeli, Mexico, 3,097. 72, Anneli Blomqvist (n), Sweden, 3,092. 73, Jessica Mellott, Lauderhill, Fla., 3,091. 74, Jen Higgins, Westerville, Ohio, 3,087. 75, Laura Plazas, Colombia, 3,080. 76, Elise Bolton, Merritt Island, Fla., 3,077. 77(tie), Annie Thorell, Sweden, and Victoria Johansson (n), Sweden, 3,073. 79(tie), Stephanie Schwartz, Racine, Wis., and Summer Jasmin, Beckley, W.Va., 3,068. 81, Leanne Hulsenberg, Pleasant View, Utah, 3,067. 82, Nicole Wilson (n), Livonia, Mich., 3,063. 83(tie), Jordan Newham (n), Aurora, Ill., Sarah Wille, Hoffman Estates, Ill., and Brianna Andrew (n), Orland Park, Ill., 3,062. 86, Maribel Orozco (n), Mexico, 3,052. 87, Jeanne Naccarato, Tacoma, Wash., 3,042. 88(tie), Trisha Reid (n), Columbus, Ohio, and Jasmine Snell (n), Papillion, Neb., 3,041. 90, Kalee Tripp (n), Butte, Mont., 3,037. 91, Kaidee Sutphin, Orlando, Fla., 3,028. 92, Katie Zwiefelhofer, Racine, Wis., 3,026. 93, Nicole Bower (n), Camp Hill, Pa., 3,025. 94(tie), Putty Armein (n), Indonesia, and Bree Macpherson, Australia, 3,020. 96, Trista Kimmes, Eagan, Minn., 3,018. 97, Amanda Vermilyea (n), Apple Valley, Minn., 3,016. 98, Rebekah Martin (n), Melbourne, 3,002. 99, Lauren Pate (n), Inver Grove Heights, Minn., 2,996. 100, Novie Phang (n), Indonesia, 2,993. RENO, Nev. – Ukraine’s Daria Kovalova continued to pace the 191-player field at the 2018 United States Bowling Congress Queens and leads for the second consecutive round. The 23-year-old right-hander rolled games of 211, 230, 205, 267 and 226 for a 1,139 five-game block Friday at the National Bowling Stadium to bring her overall total to 2,384, a 238.4 average. Kovalova started the 2018 event with a blistering performance Thursday, averaging 249 for her first block. She was eager to return to the NBS for Friday’s second round and quickly settled in after trying a few different things in the early going on the fresh 38-foot lane condition. Also helping Kovalova settle in was having several of her former Wichita State University teammates in this week’s field. Kovalova was a standout during her collegiate career with the Shockers. She was named a National Collegiate Bowling Coaches Association All-American in each of her four seasons and was the most valuable player during the 2014-2015 season. Kovalova will continue to keep an open mind heading into Saturday’s final round of qualifying. Sweden’s Jenny Wegner put together the highest block during Friday’s second round to jump into second place with 2,337. Wegner rolled games of 236, 279, 233, 221 and 216 for a 1,185 total. Two-time Queens champion Kelly Kulick of Union, New Jersey, is third with 2,286, while Shannon O’Keefe of O’Fallon, Illinois, and Bryanna Cote of Red Rock, Arizona, round out the top five with 2,275 and 2,271, respectively. Defending champion Diana Zavjalova of Latvia dropped to 20th place in the standings after a 1,018 block Friday. She has a 10-game total of 2,178. Zavjalova, a two-time Queens champion, is guaranteed the No. 64 spot in the double-elimination match-play bracket at Queens, but bowling qualifying will give her a chance to improve her seeding. Qualifying will conclude Saturday, with both squads bowling on the fresh lane condition. All players will bowl 15 games of qualifying over three days to determine the 63 competitors joining Zavjalova in match play. With five games remaining in qualifying, there are three players tied for 63rd place. Indonesia’s Aldila Indryati, Debbie Ayers of La Mesa, California, and Samantha Kelly of Waukesha, Wisconsin, each are at 2,086, a 208.6 average. 1, Daria Kovalova, Ukraine, 2,384. 2, Jenny Wegner, Sweden, 2,337. 3, Kelly Kulick, Union, N.J., 2,286. 4, Shannon O’Keefe, O’Fallon, Ill., 2,275. 5, Bryanna Cote, Red Rock, Ariz., 2,271. 6(tie), Liz Johnson, Palatine, Ill., Elysia Current, Ephrata, Pa., and Diandra Asbaty, Chicago, 2,270. 9, Carolyn Dorin-Ballard, Keller, Texas, 2,238. 10, Stefanie Johnson, McKinney, Texas, 2,230. 11, Rocio Restrepo, Louisville, Ohio, 2,226. 12, Cajsa Wegner, Sweden, 2,219. 13, Cassandra Leuthold, Lincoln, Neb., 2,217. 14(tie), Erin McCarthy, Omaha, Neb., and Jordan Richard, Tipton, Mich., 2,208. 16, Aseret Zetter, Mexico, 2,192. 17, Jennifer King, Cold Spring, Ky., 2,190. 18, Julia Bond (n), Aurora, Ill., 2,187. 19, Sandra Andersson, Sweden, 2,183. 20, Diana Zavjalova, Latvia, 2,178. 21, Josie Barnes, Nashville, Tenn., 2,176. 22, Birgit Poppler, Germany, 2,172. 23, Tish Johnson, Colorado Springs, Colo., 2,171. 24, Sierra Kanemoto (n), Riverside, Ohio, 2,168. 25, Kayla Bandy, Salisbury, Md., 2,165. 26(tie), Tannya Roumimper, Indonesia, and Lilia Robles, Mexico, 2,164. 28, Ashly Galante, Palm Harbor, Fla., 2,162. 29, Haley Richard, Tipton, Mich., 2,159. 30, Lorie Schmidt (n), Henderson, Nev., 2,153. 31, Giselle Poss, Nashville, Tenn., 2,151. 32, Shannon Pluhowsky, Dayton, Ohio, 2,149. 33, Danielle McEwan, Stony Point, N.Y., 2,148. 34, Lindsay Boomershine, Perry, Utah, 2,147. 35, Natalie Goodman, O’Fallon, Ill., 2,145. 36, Clara Guerrero, Colombia, 2,144. 37, Maria Jose Rodriguez, Colombia, 2,138. 38, Katie Ann Sopp (n), White Bear Lake, Minn., 2,133. 39, Jackie Carbonetto, Clarksville, Tenn., 2,132. 40, Megan Kelly, Dayton, Ohio, 2,127. 41, Anna Andersson (n), Sweden, 2,125. 42(tie), Nina Flack, Sweden, and Mandy Etem (n), Cave Creek, Ariz., 2,119. 44(tie), Anneli Blomqvist (n), Sweden, and Taylor Bulthuis (n), Coral Springs, Fla., 2,117. 46, Jennifer Russo (n), Monmouth Junction, N.J., 2,114. 47, Summer Jasmin, Beckley, W.Va., 2,113. 48(tie), Stephanie Casey (n), Yonkers, N.Y., and Victoria Johansson (n), Sweden, 2,112. 50(tie), Verity Crawley, England, Brenda Padilla, Mansfield, Texas, Sandra Gongora, Mexico, and Missy Parkin, Laguna Hills, Calif., 2,111. 54, Estefania Cobo (n), Puerto Rico, 2,107. 55, Amanda Fry, Antelope, Calif., 2,104. 56, Kristie Leong (n), Daly City, Calif., 2,101. 57, Trista Kimmes, Eagan, Minn., 2,100. 58, Stephanie Schwartz, Racine, Wis., 2,099. 59, Leanne Hulsenberg, Pleasant View, Utah, 2,092. 60, Kalee Tripp (n), Butte, Mont., 2,091. 61, Ida Andersson, Sweden, 2,089. 62, Adriana Perez (n), Mexico, 2,087. 63(tie), Aldila Indryati (n), Indonesia, Debbie Ayers, La Mesa, Calif., and Samantha Kelly, Waukesha, Wis., 2,086. 66, Tina Williams (n), Phoenix, 2,084. 67, Elise Bolton, Merritt Island, Fla., 2,083. 68, Daria Pajak, Poland, 2,079. 69, Sydney Brummett, Wichita, Kan., 2,078. 70, Jasmine Snell (n), Papillion, Neb., 2,075. 71(tie), Shannon Sellens (n), Copiague, N.Y., Sharon Limansantoso (n), Indonesia, and Lauren Pate (n), Inver Grove Heights, Minn., 2,074. 74, Nadia Nuramalina (n), Indonesia, 2,072. 75, Annie Thorell, Sweden, 2,067. 76, Jen Higgins, Westerville, Ohio, 2,065. 77, Brandi Branka, Fairview Heights, Ill., 2,058. 78, Bree Macpherson, Australia, 2,055. 79, Britney Brown (n), Chicago, 2,053. 80, Desiree Negron (n), Puerto Rico, 2,050. 81, Juliana Franco, Colombia, 2,048. 82, Iliana Lomeli, Mexico, 2,047. 83(tie), Amber Vega, Orangevale, Calif., and Laura Plazas, Colombia, 2,041. 85, Trisha Reid (n), Columbus, Ohio, 2,039. 86, Olivia Sandham, Saint Joseph, Mo., 2,038. 87, Caycee Landers, Brockport, N.Y., 2,037. 88, Karen Barcal, Albuquerque, N.M., 2,034. 89, Kaidee Sutphin, Orlando, Fla., 2,030. 90, Karen Marcano, Venezuela, 2,027. 91, Brianna Andrew (n), Orland Park, Ill., 2,025. 92, Briana Zabierek (n), Lockport, Ill., 2,020. 93, Stephanie Martins, Brazil, 2,019. 94(tie), Joely O’Grady (n), Matawan, N.J., Amanda Vermilyea (n), Apple Valley, Minn., and Nicole Wilson (n), Livonia, Mich., 2,017. 97, Dena Buxton, Australia, 2,016. 98, Mariana Ayala, Euless, Texas, 2,006. 99, Jodi Woessner, Oregon, Ohio, 2,004. 100(tie), Michelle Sterner (n), Niagara Falls, N.Y., Pamela Alvarez, San Diego, and Liz Kuhlkin, Schenectady, N.Y., 2,001. RENO, Nev. – Ukraine’s Daria Kovalova was at the head of the class Thursday at the 2018 United States Bowling Congress Queens, averaging nearly 250 on the way to capturing the opening-round lead. The 23-year-old right-hander rolled games of 236, 247, 236, 259 and 267 at the National Bowling Stadium for a 1,245 total. Kovalova started the 2018 PWBA Tour season with a solid start at the PWBA Las Vegas Open in April, finishing 11th overall. She missed the next two stops, however, as she finished her degree in art and illustration at Wichita State. Kovalova kept her options open while competing on the burn squad Thursday and let this week’s 38-foot lane condition show her the way. Sweden’s Cajsa Wegner was second for the day with 1,218, while Team USA’s Shannon O’Keefe of O’Fallon, Illinois, was third with 1,210. A pair of past Queens champions, Diandra Asbaty (2012) of Chicago and Kelly Kulick (2007, 2010) of Union, New Jersey, rounded out the top five with scores of 1,200 and 1,187, respectively. Defending champion Diana Zavjalova of Latvia is ninth after Thursday’s five-game block with a 1,160 total. Competition will resume Friday at noon Eastern with the second round of qualifying. All bowlers will bowl 15 games of qualifying over three days to determine the 63 bowlers joining Zavjalova in match play. 1, Daria Kovalova, Ukraine, 1,245. 2, Cajsa Wegner, Sweden, 1,218. 3, Shannon O’Keefe, O’Fallon, Ill., 1,210. 4, Diandra Asbaty, Chicago, 1,200. 5, Kelly Kulick, Union, N.J., 1,187. 6(tie), Cassandra Leuthold, Lincoln, Neb., and Giselle Poss, Nashville, Tenn., 1,166. 8, Aseret Zetter, Mexico, 1,162. 9, Diana Zavjalova, Latvia, 1,160. 10, Rocio Restrepo, Louisville, Ohio, 1,158. 11, Jenny Wegner, Sweden, 1,152. 12, Adriana Perez (n), Mexico, 1,144. 13(tie), Elysia Current, Ephrata, Pa., Julia Bond (n), Aurora, Ill., and Haley Richard, Tipton, Mich., 1,142. 16, Sandra Andersson, Sweden, 1,134. 17, Sierra Kanemoto (n), Riverside, Ohio, 1,132. 18, Missy Parkin, Laguna Hills, Calif., 1,125. 19, Natalie Goodman, O’Fallon, Ill., 1,121. 20, Victoria Johansson (n), Sweden, 1,118. 21, Stefanie Johnson, McKinney, Texas, 1,115. 22, Christina Kinney (n), Las Vegas, 1,113. 23(tie), Liz Johnson, Palatine, Ill., and Sandra Gongora, Mexico, 1,110. 25, Carolyn Dorin-Ballard, Keller, Texas, 1,109. 26, Bryanna Cote, Red Rock, Ariz., 1,108. 27, Jordan Richard, Tipton, Mich., 1,105. 28, Taylor Bulthuis (n), Coral Springs, Fla., 1,100. 29, Estefania Cobo (n), Puerto Rico, 1,099. 30, Lauren Pate (n), Inver Grove Heights, Minn., 1,097. 31(tie), Maria Jose Rodriguez, Colombia, and Clara Guerrero, Colombia, 1,085. 33(tie), Karen Barcal, Albuquerque, N.M., and Kayla Bandy, Salisbury, Md., 1,083. 35, Dena Buxton, Australia, 1,079. 36, Kristie Leong (n), Daly City, Calif., 1,078. 37(tie), Tish Johnson, Colorado Springs, Colo., and Josie Barnes, Nashville, Tenn., 1,075. 39, Trista Kimmes, Eagan, Minn., 1,074. 40(tie), Jennifer Russo (n), Monmouth Junction, N.J., Mandy Etem (n), Cave Creek, Ariz., and Katie Ann Sopp (n), White Bear Lake, Minn., 1,073. 43, Danielle McEwan, Stony Point, N.Y., 1,071. 44, Britney Brown (n), Chicago, 1,070. 45(tie), Samantha Kelly, Waukesha, Wis., Annie Thorell, Sweden, and Jackie Carbonetto, Clarksville, Tenn., 1,068. 48(tie), Tracie Ball (n), Las Vegas, and Katie Zwiefelhofer, Racine, Wis., 1,066. 50, Tina Williams (n), Phoenix, 1,065. 51(tie), Stephanie Martins, Brazil, and Erin McCarthy, Omaha, Neb., 1,064. 53, Daria Pajak, Poland, 1,061. 54, Nicole Bower (n), Camp Hill, Pa., 1,060. 55, Sydney Brummett, Wichita, Kan., 1,059. 56, Birgit Poppler, Germany, 1,055. 57, Anneli Blomqvist (n), Sweden, 1,053. 58, Lilia Robles, Mexico, 1,052. 59(tie), Emily Peterson (n), West Fargo, N.D., and Anna Andersson (n), Sweden, 1,051. 61(tie), Laura Plazas, Colombia, and Stephanie Casey (n), Yonkers, N.Y., 1,050. 63(tie), Brenda Padilla, Mansfield, Texas, and Verity Crawley, England, 1,048. 65, Shannon Pluhowsky, Dayton, Ohio, 1,047. 66(tie), Jen Higgins, Westerville, Ohio, and Sarah Wille, Hoffman Estates, Ill., 1,044. 68(tie), Jennifer King, Cold Spring, Ky., and Rebecca Broerman (n), Altoona, Iowa, 1,042. 70, Nicole Wilson (n), Livonia, Mich., 1,039. 71, Amanda Vermilyea (n), Apple Valley, Minn., 1,037. 72(tie), Amber Vega, Orangevale, Calif., and Sharon Limansantoso (n), Indonesia, 1,034. 74, Summer Jasmin, Beckley, W.Va., 1,033. 75, Shannon Sellens (n), Copiague, N.Y., 1,030. 76(tie), Lindsay Boomershine, Perry, Utah, and Debbie Ayers, La Mesa, Calif., 1,029. 78, Elise Bolton, Merritt Island, Fla., 1,026. 79(tie), Nina Flack, Sweden, and Jessica Mellott, Lauderhill, Fla., 1,024. 81(tie), Brandi Branka, Fairview Heights, Ill., Karen Marcano, Venezuela, and Megan Kelly, Dayton, Ohio, 1,021. 84(tie), Lorie Schmidt (n), Henderson, Nev., Tannya Lopez, Mexico, and Shawna Strause (n), Tucson, Ariz., 1,019. 87, Juliana Franco, Colombia, 1,018. 88, Blair Blumenscheid (n), Columbus, Ohio, 1,016. 89(tie), Aldila Indryati (n), Indonesia, and Maribel Orozco (n), Mexico, 1,015. 91, Briana Zabierek (n), Lockport, Ill., 1,013. 92(tie), Brandi Calderon (n), Mesa, Ariz., and Brooke Bower, Camp Hill, Pa., 1,012. 94, Tannya Roumimper, Indonesia, 1,011. 95, Natalie Dutton (n), Jenks, Okla., 1,010. 96, Ida Andersson, Sweden, 1,009. 97(tie), Liz Kuhlkin, Schenectady, N.Y., and Brianna Andrew (n), Orland Park, Ill., 1,008. 99, Kelly McCutcheon, Middletown, Pa., 1,007. 100(tie), Olivia Sandham, Saint Joseph, Mo., and Novie Phang (n), Indonesia, 1,006.